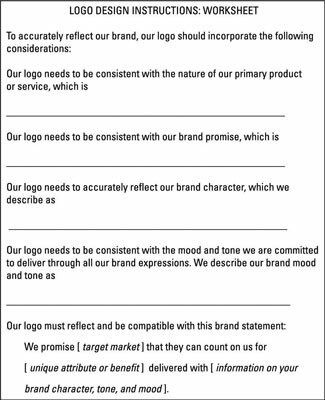 Whether you do it on your own or call upon professional expertise, start developing your brand’s logo design by completing this worksheet so that you or your logo-design team members understand the brand your logo must reflect before the creative process begins. A description of your clientele. Three to six words that you think best describe your brand and offering. Samples of logos you like and don’t like, along with some idea of why you feel the way you do about each one. Input regarding design, color, and shape considerations. As you go through the design process, be aware that typestyle, colors, and shapes have a bearing on the way a logo communicates. Choose a typestyle that matches the character of your brand. If your brand character is buttoned-down and professional, choose a typestyle that looks professional and even formal. If your brand character is casual, choose a typestyle that looks casual, too. Customize the presentation of your name in your logo. Type that’s professionally arranged has its spacing adjusted, called kerning, so that letters are placed in uniquely pleasing configurations. The difference is almost imperceptible, yet it makes a dramatic difference in the appearance of a wordmark, and it’s one of the reasons logo designers earn their fees. Your logo’s color scheme can become an essential element of your brand identity. Coca-Cola is red; IBM is blue; John Deere is green. Establish a color scheme that differs from the scheme used by your major competitors. Choose a color scheme that reflects your brand character. If your market is comprised of young children, logo colors that resemble decorations on a birthday cake may be ideal. The same colors would hardly work for a respected plastic surgeon or corporate law firm. Choose colors that reflect your brand and the expectations customers have when selecting your offering. Consider how your colors will be interpreted in other cultures or countries if your brand will be marketed internationally. If your logo will appear on apparel or specialty items, consider how the colors will look on uniforms, golf shirts, ball caps, coffee mugs, or the dozens of other places it may end up. The fewer colors you employ, the easier your logo will be to manage. No matter what color scheme you adopt, be sure your logo works beautifully in plain old black and white. Most logos need to work well in a horizontal configuration that’s about half as tall as it is wide. In other words, they need to look good in the return address portion of a business envelope, in the top corner of a web page, and on the shirt pocket of uniforms or logo apparel. Whatever configuration your logo takes, be sure it can reduce down to the size it will appear on a business card. When reviewing logo designs, put them through a preliminary test to see if they incorporate the traits of most good symbols. Do you think the logo makes a good impression for your business? Is it easy to see and remember? Does it work in a single ink color and at a small size? Think twice before handing the logo-design task over to your cousin’s nephew or undertaking it on your own. Your logo visually represents your brand. If you want to compete with great brands, hire an expert who specializes in logo design. Don’t let the design get too fussy. Your logo makes the difference between a strong and a weak first impression for your business. If you create your logo by using the templates available online or in publishing programs, customize colors, symbols, and typestyles so that you end up with a unique look for your business. Use the same design software that professionals use. Most designers use Adobe Illustrator, known as vector-based graphic design software, which means that the final logo design can be enlarged or reduced without design distortion or loss of quality. Choose a professional whose expertise, size, and fees fit your needs. Options range from freelance artists to small design studios to local, regional, national or global ad agencies to internationally renowned identity developers. You can spend anywhere from several hundred dollars up to the million-dollar range. If you want a logo that competes well in a local market, set aside a small budget and find a local resource. If you aspire to make the list of the world’s top brands, turn to the talents of award-winning brand specialists, and plan to invest accordingly. Review work samples to be sure that the designer’s style matches with your expectations. Be clear about your budget and obtain cost estimates before authorizing design work to begin. Stipulate that you will own all rights to your logo after you pay in full for its design and production. Upon approval of your final logo design, obtain copies of the artwork in EPS format for printing purposes and in JPG and GIF formats for online use.